There is something about a scoop of sorbet that cools you down. We were having our typical December weather. The wind was blowing and it was hot. People usually complain about the Gordons Bay holiday weather, but it does not keep them away from our beautiful beaches and glorious mountains. We love it here in December but the heat can get a bit much. I have got used to the wind and constantly sweeping out the house and fixing the blind that does not like being blown about. It means my laundry gets dry within 5 minutes but it also means needing a cold shower often during the day. Some nights it is too hot to sleep and I lie on the tiled floor hoping for some cooling relief. When it is this hot a sorbet does the trick. The icy cold sensation of melting fruit cools me down. And as it was the holiday season I decided I would make something with a little bit of alcohol in it. I was thinking about grapefruit sorbet with gin but then decided that blackberries with a spicy cherry liqueur would do the trick. I have several tot bottles in my freezer which need using up in a creative way. You can substitute the berries and booze for any flavour that you choose. what do you eat to cool down in summer? this sorbet was so good it escaped the camera! Lucky for you the warm weather has not left Gauteng yet! Hey, how did I miss this recipe. Love the idea of the berries and the booze, might not be able to serve this one to my teenager but great for us adults. Always nice to have a treat in the freezer just for you! 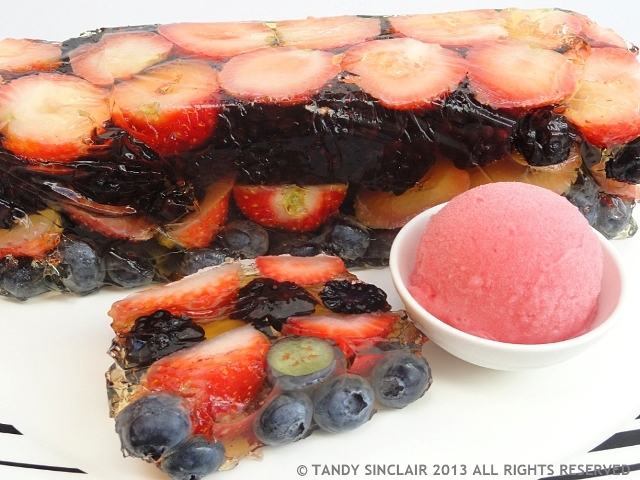 I love the look of all those berries in your terrine! The flavor of your sorbet sound very refreshing. If you were at my home now, you could cool off by crunching around in the snow. looks delicious! That terrine looks equally as good too! Great idea. I like sorbet because it is not too sweet. I like to cool down with cucumbers too. I could try and make a cucumber sorbet! I have another one you might enjoy! Very pretty looking dessert and lovely flavours.